The short of it: more money than we'll earn in 10 lifetimes. It's no coincidence that Floyd Mayweather's moniker is "Money" and Emmanuel Pacquiao's nickname also rhymes with the conventional term for moolah. Both have become perfect examples of how much dough the sport of boxing can reward its practitioners. Both men have become über-wealthy thanks to their illustrious careers, but it seems that each handles their affluence differently. This got us thinking, "How would we spend all that money?" Thankfully, both fighters have shown us ideas on how to splurge, through the years. 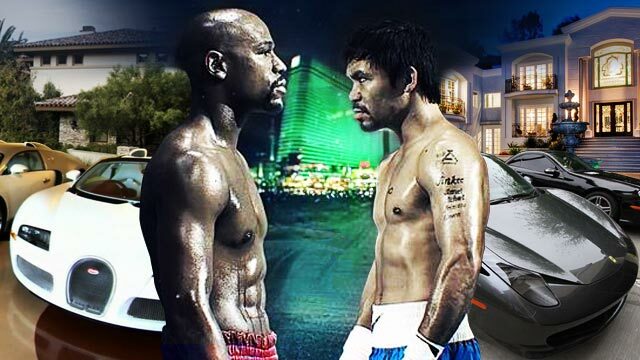 Here now is a look at Mayweather and Pacquiao's ridiculous riches, or as we call it, the #MayPac Tale of the Wallet! According to Celebrity Net Worth, Floyd's wealth is valued at an estimated $280 million, more than doubling Manny's $110 million. It's not actually surprising given Money ranked No.1 in Forbes' The World's Highest Paid Athletes list last year, while Pacman was at the 11th spot. Manny recently bought a mansion in Beverly Hills previously owned by P. Diddy and J.Lo for $12.5 million. He included four tickets to the big fight to sweeten the deal. Nooice! He also has a two-storey house in Los Angeles, which he bought in 2009. Sons Jimwel and Michael attending Brent international School was the main reason they bought their six-bedroom Laguna house. ...and even his own basketball court! Sweet! Floyd reportedly has a couple of houses in the Las Vegas area, but his pride and joy is his 22,000-square foot "Big Boy Mansion," which has its own Instagram account. You read that right. Here is its account bio: "This mansion speaks because it was paid in cash." Floyd also owns a posh 3,000-square foot, four-bedroom condo in the Miami area. This crib by the beach, which offers a 360-degree view of the Atlantic Ocean, has reportedly been up for sale since last year for $2.6 million. While it takes a few years for an average person to buy his dream car, these two pound-for-pound greats have a fleet of supercars taking them and their families around. Can you guess which of them have more rides (and is more boastful about it)? Our brother website Spin.ph recently took exclusive photos of two of the Filipino Pride's luxury cars from his extensive collection, taken from his Los Angeles home. Though quite low-key with his car collection here in the Philippines, Manny, in 2011, reportedly purchased a Cadillac Escalade and Hummer H2 from International Armoring Philippines for the protection of his family. Early this year, Floyd shared a photo of his exquisite car collection on Instagram, with his jet serving as the backdrop. He also generously included the price of each. They say all that glitters is not gold, but will you still complain if you have the money to buy anything that glitters? In his case, it's better to read up on stories about his wife Jinkee and Mommy Dionisia's shopping escapades as Manny is quite the humble dresser (although he does like his Hermès belts). The mag-biyenan, meanwhile, fancy signature brands. Meanwhile, the Pac-mom's hardships and sacrifice during Manny's younger years have no doubt paid off.